Authorities says evidence recovered from a captured alligator indicates it bit and probably killed a woman while she was out walking her dogs next to a Florida lake. The Florida Fish and Wildlife Conservation Commission said in a statement that a necropsy of the reptile Friday produced evidence "that indicates the victim ... was bitten by the alligator." The statement went on to say that officials believe the woman was killed "and we will continue recovery efforts." They did not identify the victim. Davie Police Detective Viviana Gallinal says a witness told authorities he saw the woman walking two dogs and then noticed the dogs alone, barking near the water. One of the dogs had a fresh injury. Gallinal said trappers had seen a 12-foot (3.5-meter) alligator and residents said they've also noticed a large gator in the area recently. Authorities are working to capture an alligator in a Florida pond after a witness' report led police to believe the animal may have dragged a woman into the water. However, it remained unclear Friday what the witness saw. News media earlier reported a caller told police he saw a gator drag a woman into the water as she was walking her dogs. Davie Police Detective Viviana Gallinal now says the witness told authorities he saw the woman walking two dogs and then noticed the dogs barking near the water. The witness did not see the woman again. Gallinal said trappers have spotted a 12-foot (3.5-meter) alligator in the pond. News media earlier reported divers were searching the water. 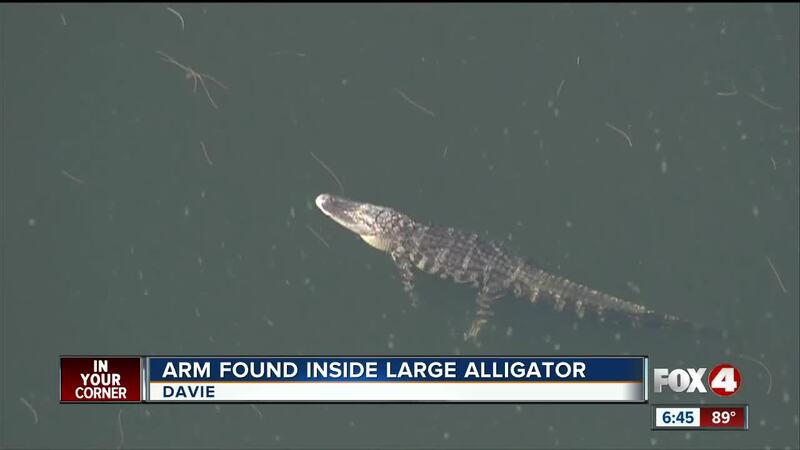 However, Davie Police Maj. Dale Engle clarified that no divers could search the water until the alligator was captured. In a Sun Sentinel report , Davie Police Maj. Dale Engle said the woman's dogs would not leave the pond as divers searched for her Friday morning.